In the morning, we went to the local post office to mail a few items to lighten our weight. We mailed approximately 4 lbs, which made our side cases weight about 39 lbs each. After riding for about 2.5 hours, we stopped in a small town in the middle of nowhere – Roosevelt. 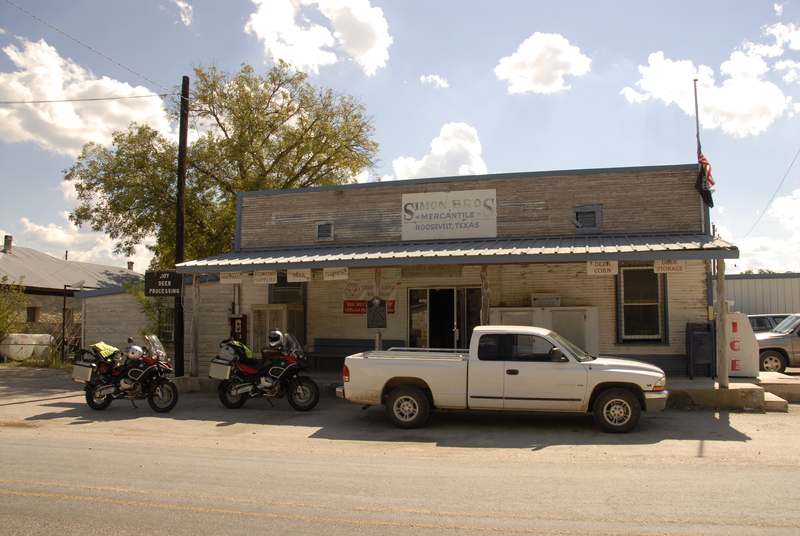 We took a few pictures of the local convenience store/gas station/post office, where we bought some cold water. On the way to Fort Stockton (about 150 miles from the border), we saw many windfarms…100s of turbines. They were massive. Prior to arriving to our destination for tonight, we almost ran out of gas as the gas stations are more than 30 miles apart. We arrived to Fort Stockton around 5:30 pm and had dinner at K-Bob’s Steak House. Prior to returning to hotel, we stopped at a local gas station where we picked up some water and engine oil. We spoke to some locals about the border situation.